Why? A question asked millions of times a day for many different reasons. So, you may be wondering why video? Take a step backwards and ask yourself why are you here? To connect. We are all here to connect. Connecting with friends, family, and life itself. Life is about people. Video is about connecting with people. Our job is to help you connect with those people. It’s not just about creating a video; it’s about telling a story. A story that people can enjoy, feel, emote, and ultimately connect with. We all have a story. Let us help you share yours. LC Productions based out of London, Ontario, is an established, creative, and dependable video production company, with an incredible zeal for what we do. Our mission is to support our clients and assist them to successfully achieve their video production goals. Our main priority is to bring our customers vision to life through high quality, cinematic content directed towards their targeted audience. The relationships we continue to develop are an integral part of who we are today. Our work is distributed through magazines, newspapers, movie theatres, sporting venues, cable TV, and to the world through the Internet. LC Productions utilizes state of the art equipment to guarantee a high quality product is received by our customers. The LC Productions team has over 30 years combined experience in corporate filmmaking, scripting, and editing. LC Productions has extensive experience scripting, producing, lighting, and editing videos for a variety of clients with a specialization in corporate filmmaking. We utilize creativity to produce videos that tell a story, where the audience is engaged, having an emotional impact on the viewer. It’s this expertise in storytelling that not only makes our products stand out from the competition but extremely effective for our clients. Our team of creative cinematographers create a fun, comfortable, and professional work environment. LC Productions has demonstrated the ability, capacity, and dedication to complete video production projects on time and within budget. They truly went above and beyond to create an exceptional product for us. It was a pleasure to work with LC Productions' team and I would not hesitate to use their services in the future. Our hospital staff, patients, and families involved extensively praised the LC Production's team for their respectfulness on set and felt comfortable during the video shoot. Throughout the entire process, we have had excellent communication with LC Productions. Everything from preproduction to the finished product ran very smoothly. Videos have proven to increase overall traffic to your website, click troughs, consumer engagement, conversion rates, and most importantly, sales. Let’s face it. The majority of people would rather watch a short 2-3 minute video then read a page full of information. Videos provide multi-sensory stimulation (visual and audio) making it easier and more appealing for someone to watch. Although a video is a form of marketing in itself, it blends perfectly with all other marketing platforms you may use as well. Whether you use the video at a trade show, on social media, or the home page of your website, a video is the perfect addition to any marketing campaign. We can take your project from start to finish or help with any of the steps along the way. Many of our customers have varied needs that may require a simple camera shoot, some editing or a narration voice-over for an in-house project, while others require a full on commercial production. Whatever your needs, we’re flexible and will work with you to apply our areas of expertise where you need it most. And after years of experience in corporate video production we’ve honed our process down to a science. We listen, ask questions, get to know you and your company, the project, budget, target audience, distribution and, most importantly, the goals and objectives associated with the video. Understanding your company and its brand, along with the wants and needs of your marketplace, helps us to create an effective video that leaves a lasting impression on your audience. Pre-production means moving into creative and logistic mode, which can cover tasks ranging from script-writing, storyboarding, equipment choices, budget allocations, project management and scheduling. As Winston Churchill once stated, “failing to plan is planning to fail” and pre-production is integral to ensuring your project stays on time and on budget. This is where the magic happens. 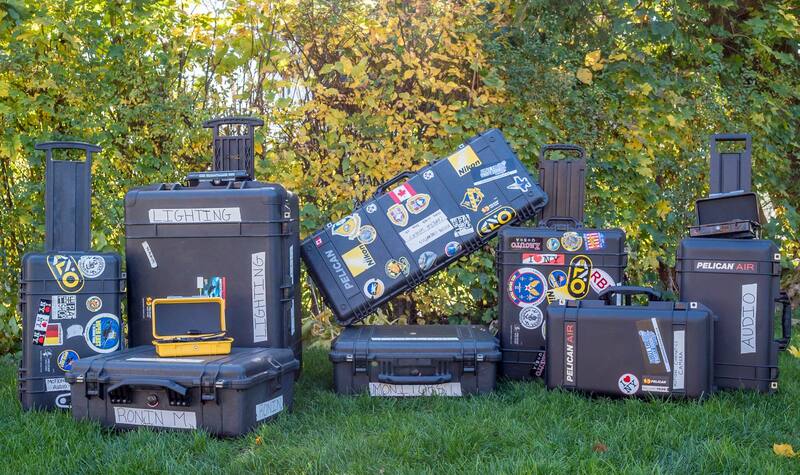 Most clients are surprised at the amount of gear we haul around to cover the basics. Other production tasks may involve location set-up, framing, selecting angles, props, backgrounds, directing talent and whatever else it takes to make your video project great. The post-production stage is multifaceted in the way it can involve a number of team members. Most video productions involve graphic design, audio enhancement and treatment, voice-over talent, a director overseeing the work, music, editing, motion graphics or special effects and many other fun things. Once proofing and revisions are complete, we provide final master copies for your records. It doesn’t need to stop there though. We often help customers market their video through social media. "We connect with our customers’ audiences. It’s not about the amount of gear we have or our fancy cameras. It’s about your message." Children's Clothing Commercial | OS + OAKES | LC Productions from LC Productions on Vimeo. Video doesn’t have to be expensive. Fact is, you can be every bit as effective with a small- budget video as you can be with a national campaign-sized budget. Video production is scalable, depending on the production elements you choose to include. By working with you to analyze your business needs, we can help you determine priorities that make sense for your goals and your budget. Like many creative industries, it’s almost impossible to take two quotes from two suppliers and compare them by line item because each company will take a different approach to a project. Instead we recommend speaking with the shortlisted firms about how and why their proposed approach will best serve your business goals. Review the proposals for must haves vs nice to haves. Interview references specifically for their satisfaction and experience, not on the production quality alone. Focus your conversations on whether the proposed plans will actually impact your business in a positive way. For the most part, budgets are based on the resources needed to deliver a project. Grouping similar projects together will bring down budgets drastically because of scalability. For the most part, economies of scale find savings through each step of the production process. "THIS IS OUR SPECIALTY, AND YOU DESERVE THE BEST."